It is truly a pleasure to speak to you today on that extraordinary American and far-seeing world citizen, Thomas Paine. Paine was a remarkable man by almost any intellectual and moral standard. Long overlooked in the 19th and early 20th Centuries, he is being increasingly recognized as a forerunner of our emerging global culture. For example, Paine’s overarching vision and moral prescience were celebrated and honored at a United Nations colloquium in December of 1987 – the occasion of his 250th birth anniversary. More recently, many free thinkers, radicals and progressives gathered together in local parks and public halls to commemorate his 200th death anniversary. It is only fitting then, that we who are gathered here today to pay tribute to the free-thinking, human spirit, should pause and pay homage to this most gifted and noble of 18th Century visionaries. In brief, Thomas Paine was born in Thetford, England in 1737 and died at the age of seventy two in Greenwich Village, New York in 1809. When we look back over the entire arc of his rich and variegated life, certain things become crystal clear to us. It is apparent to the discerning student of history that Paine was the most forward-looking thinker of the American Revolution and the foremost advocate of the democratic spirit of individual rights, religious liberty and social justice. He embodied the most admirable qualities of Franklin, Washington and Jefferson but with few of their foibles. He was daringly visionary, truly brilliant, supremely articulate and absolutely indomitable in his service to the cause of political Independence in America and of universal rights everywhere. Paine was also unusual in that he was essentially untainted by the major vices of his historical epoch: slavery, religious bigotry, monetary greed and political ambition. His humanitarian concerns for the common man were all-encompassing and his revolutionary social, political and economic proposals proved to be fundamental correctives to the persistent ills of his era. In a word, Paine was (and continues to be) the gold standard of the true, conscientious radical reformer: principled, clear thinking, magnanimous, inclusive and fearless in thought and conduct. Paine’s revolutionary, best-selling book, The Rights of Man, gave the common man in late 18th Century Europe, England and America confidence in his own innate dignity, his natural rights and his expanding civic responsibilities. Later on, as one of only two non-French born members of the National Assembly, Paine helped to draft the “Constitution of the Republic of France” and undoubtedly influenced the drafting of “The Declaration of the Rights of Man and of the Citizen”. Despite being imprisoned by the infamous Robespierre during the Reign of Terror, a post-revolutionary Napoleon toasted Paine by saying: “Every city in the world should erect a gold statue to you.” In addition to playing significant revolutionary roles on three continents, Paine’s fertile and compassionate mind inspired him to write one of the earliest essay against slavery, to pen one of the first articles on the dignity and silent suffering of women, to set forth one of the first arguments for universal public welfare as well as for a guaranteed annual income, and, last but not least, to prophetically call for a “Congress of Nations” to settle international disputes. On the whole, Paine has been celebrated by feminists, humanists, religious thinkers, scientists and artists. His resurgence in both academic and political circles is timely since America is once again at a historical cross-road, a stirring and confusing period which “tries men’s souls”. Turning to Paine’s telling prose and fearless example, many of today’s thinkers find Paine’s enthusiasm and optimism uplifting and his inclusive vision compatible with the emerging global culture of national interdependence and human solidarity. There is undoubtedly a predisposition among many to include Paine in the pantheon of those heroes who fought for a ‘universal civilization’ for all mankind. This is a fitting recognition for one who called himself a ‘Theophilanthropist’, a lover of God and humanity. Paine’s deep love of the divine and his unconditional commitment to expanding universal, human rights were bridged by the luminous arc of enlightened reason. Deity and humanity are dialectically bridged through a vibrant gnosis or knowledge which is the fruit of deep reflection on Nature in its widest and richest sense. To understand Paine’s conception of science as the “real theology”, we need to briefly examine Paine’s notion of God, Nature and humanity. This is particularly important today when science seems to be opening up and entertaining new dimensions of matter (string theory) and considering new paradigmatic models of integration( holistic science, systems theory and deep ecology)– despite its often strong reductionist and materialistic tendencies. As we can see from this statement, Paine was a deist, not a theist. He uses Enlightenment language when he speaks of God as Deity and refers to the latter as a “First Cause”. To Paine, all anthropomorphic conceptions of God are irrational and really a species of atheism. (Paine, you will be pleased to know, considered pure atheism to be “half rational”.) Anthropomorphic conceptions of God, in whatever form, really disfigure the divine and corrupt the ethical intelligence of man. Conventional Christianity, Judaism and Islam all distort the transcendent splendor, immense majesty and meta-intelligence of Deity. Given all this, how then is the rational person to understand Deity as a “First Cause”? Deity is that unknowable, self-existent Cause that initiates the cosmic community but does not, itself, interfere with the creative and shaping will of mankind. Deity thus transcends space and time, matter and motion, consciousness and form. It is neither locatable in any particular point in cosmic space nor frozen at some metaphysical moment of Fiat Lux. Yet, paradoxically, Deity is instantaneously immanent as well as transcendent. While the divine is unfathomable, something of its ineffable intelligence is creatively active in the whole of manifested creation. The psychological parallel of this divine, paradoxical truth in man is the fact that we are simultaneously spectators as well as energic actors on the stage of history. We are witnesses as well as active participants in the unfolding drama of life. Man alone can step back from himself and, by an act of will, create a new and just world around and within him. In this sense, each of us possesses a god-like capacity to transcend and initiate within ourselves a moving field of circumstance as we grow in our knowledge, skill and self-awareness. Two telling analogies – drawn from Nature and science respectively – are useful in helping us to grasp the recondite concept that Deity is both transcendent and immanent, both above the cosmos and yet within it. The analogy from Nature is that of the sun within our orbiting solar system. We are aware of the sun’s existence by virtue of its omni-directional, iridescent light. We never see the sun directly with the unprotected human eye. The rays of the sun are the luminous evidence of its existence. Its illuminating power makes the multitudinous objects of this world visible. Thus, the sun itself is “above us” at a great distance while its shadow-dispelling light is immediately present among us. In this sense, the sun is clearly both remote and near at hand. Its perpetual cycles of fecundity, nourishment and destruction are the transparent proof of its potency in our biosphere. By analogical reasoning, Deity is both beyond and within everything. The analogue from science is that of light focused through a prism. When a ray of light is refracted through a prism it is differentiated into a rainbow of colors. Deity, in this example, is analogous to the light that exists prior to being focused through the prism (matter) and is therefore apart from any particular color or combination of colors. Nonetheless, Deity also “enters” into the spectrum of colors through the mediating prism according to laws that regulate its vibratory expression. The light is therefore both colorless and tinted. By analogy and correspondence, then, Deity is both transcendent and immanent. The incommensurable effulgence participates in the commensurably known, the uncircumscribed infinite is reflected in the confining finite and the motionless eternal is mirrored in progressive stages of time. This is paradoxical. But, as Paine intimated, this is because Deity is ultimately para-rational. It is beyond the comprehension of the rational, finite mind even though we must posit its existence. This reminds one of the paradox of the Godhead specified by Nicholas of Cusa in the Catholic Church. He said that God is a circle whose center point is everywhere and whose circumference is nowhere. Tolstoy, the brilliant Russian novelist of the 19th Century, made a similar discovery when he was only twelve years old. According to Tolstoy’s own account, he had just finished a geometry tutorial and was alone in his room. He sat down and drew a circle on a piece of paper. He then penciled in the center point of the circle and said to himself, “This is the question of my life, this I must answer before I die. The question is”, said a young, precocious Tolstoy, “what is the connection between the center and the circumference of the circle? In other words, what is the possible relationship between the finite mind of man and the infinite mind of God?” These kinds of meta-questions often disturb us or we simply dismiss them in frustration. They perplex the mind and boggle the imagination. But, then again, great men and women often make such questions the quest of a life time. Paine was such a person. What then is the “universal script” of Nature? What language does Nature really speak? It is the language of abstract principles. There is a sort of “algebra” of Nature that exists beyond the phenomena perceivable by our senses. This “algebra” reveals itself to the individual’s reason in the form of mathematical and geometric principles, traceable biological processes and established cyclical patterns. In a word, the “cipher of creation” is what we term Natural Law in its most comprehensive sense. Nature is intelligible and capable of being understood in terms of principles and hypotheses because it emanates from an originating, cosmic intelligence. Thus, the study of Nature in general, is an attempt to discover the “logos of Deity”, the subtle domain of intelligible principles which are eternal and unvarying. Let us be clear on this point. Matter is the field of forms, of changing shapes and heterogeneous forces. Matter does not “create” principles or laws – nor do circumstances or sensible phenomena. Only the Deific essence emanates principles and laws which structure and harmonize the forces of the material world. And, only human reason can grasp these abstract principles and laws of Creation. Thus, the mind of humanity does not either impute or invent principles and laws; it discovers or uncovers them by active reflection upon the phenomena and events of life. Furthermore, it is important to understand that when Paine speaks of studying nature he has a dual purpose in mind. Initially, one investigates Nature to make it comprehensible and its knowledge useful to society. But, equally if not more importantly, one contemplates Nature to discover spiritual and moral meaning. This is clearly a higher order cognitive activity. Nature is a living parable of the Divine life and it is understood through analogy and correspondence. Empirical methods yield an understanding of phenomena for intellectual and utilitarian purposes, but studying nature analogically yields a spiritual dimension because Nature is suffused with Divine Intelligence which when rightly understood can guide us in the principles of right living and high culture. Nature’s “language” or its “laws” cannot be made intelligible nor its symbolic meaning understood without the luminous faculty of self-conscious reason. Enlightened reason is the most sublime gift of Deity. It is the multifaceted faculty by which we discern the principles and transformational processes of Creation. Reason alone is capable of being impersonal and universal. It can explain and reflect, objectify and internalize truth at every level, whether spiritual, mathematical or empirical. 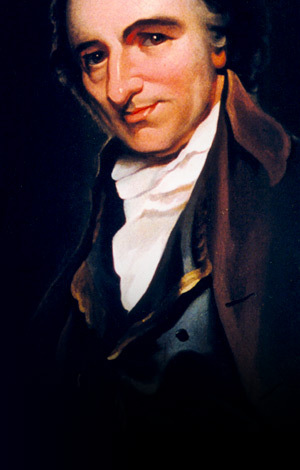 Abstract principles, states Paine, are not a “quality of circumstance”. That is, they are not phenomenal or directly presented to the five senses. Rather, principles are apprehended by the “rational” faculty in man. Principles, in essence, are eternal while the forms of expressing them and the circumstances in which we discover and apply them are endlessly changing. The same thought or principle can be expressed in various languages and often in many different forms of explanation and reasoning. Thus, the principle itself – however expressed – will survive for all time. The particular form which is used to express it will not. Furthermore, since principles are eternal, the consciousness that perceives them must likewise be eternal. Paine illustrates his conception of immortality by turning to Nature and, as we saw with Deity, reasons by analogy and correspondence. He illustrates his point about what he termed “continuity of consciousness through variability of form” by citing the transformational stages of the caterpillar as it turns into a butterfly. In summary, man is an immortal, rational and moral agent. His peculiar form of rationality allows him to decipher the intelligence and benevolence of Deity as it is reflected in Nature. Thus, every person’s mind is its own church. Likewise, conscience is inherent in the human race and is its moral compass when it is once awakened. Like the mariner at sea, humanity has to learn to use its awakened conscience to skillfully navigate the shifting currents of life. In its simplest form, conscience is knowledge of right and wrong action for the sake of the common good. “ I have said in the course of this discourse, that the study of natural philosophy is a divine study, because it is the study of the works of God in the creation….All the principles of science are of divine origin. (“A Discourse at the Society of Theophilanthropists”, 1797, Paris, France). Paine was first and foremost interested in science. As he, himself, remarked later in life: “The natural bent of my mind was to science.” He was fascinated by science all his life and had an affinity for mathematics. While in his late twenties and early thirties, he attended lectures on Newtonian physics at the Royal Society in London. Later on, after the American Revolution, he worked tirelessly on developing an iron bridge which was later approved for experimental purposes by the French Academy. Paine’s love of science was genuine. However, his view of science was multi-leveled. That is, scientific investigation is indeed empirical and practical, but it is also metaphysical and mystical. The former involves the logic of induction and deduction and the latter involves intuition and reasoning by analogy and correspondence. Let us pause for a moment and look at Paine’s conception of true scientific investigation. As we have seen, Paine claims that the true religion of man involves contemplating the power and wisdom of Deity. However, we can only know Deity indirectly, through the study of Its Creation. The implication of Paine’s statement is that the “the contemplation of Nature”, or what we call “science” is a sacred activity. In its purest form it is the only real form of theology. In this sense, the genuine person of religion is a fledging scientist and the true scientist is an apprentice of the divine. (In this regard, it is interesting that the many of the initial members of the Royal Society in England were clergymen and Freemasons.). To grasp the principles or laws of Nature is, in some sense, to see God “face to face”. It is by the quiet contemplation of Nature’s systems and interactions that we release the subtler cognitive dimension of reason and grasp the lessons of Nature for humanity. Nature’s laws, then, are the true revelation of God and the individual must enter into the cathedral of the Natural world with reverence, readiness and a child-like receptivity to the deeper lessons it holds. Now, how might we benefit from this brief exploration of Paine’s views on God, Nature, Man and science? It is a common historical truth that our greatest predecessors are often forerunners. They are prescient visionaries who often see farther ahead then we do. Paine was such a predecessor. He foresaw a political and social revolution in the affairs of men and women far beyond his age. He thought globally even if he acted on the limited stage of nations. Furthermore, he predicted that the religion of the future would be one in which all the historical and institutional excrescences would be cut away by enlightened understanding and all that would remain would be pure Deism – the original religion and the truest of sciences. Would Paine have any comment to make about our spinning, tilting modern world, about our peculiar modern mind-set? Absolutely. His first point would be, perhaps, that contemporary religious leaders and celebrated scientists should be deeply concerned with the ethics of knowledge and their knowledge of ethics. We are citizens of a “Republic of Conscience” and our primary duty is to contribute to its welfare and uplift. As such, we are all equally responsible for the knowledge that we garner within the portals of academia, within the cloistered courtyards of monasteries and within the laboratories of large, profit driven corporations. The ‘disinterested pursuit of knowledge’ can never be divorced from an all-embracing human purpose. When the noblest impulses of genuine science and of authentic religion are ignored or supplanted then religion degenerates into religiosity and likewise the search for ‘natural philosophy’ or scientific understanding gets tunneled into methodological dogmatism and valueless research. To put this in human terms, the problem with many sincere religious seekers in practice is a tendency toward a righteous, personal insularity from the world and ‘the worldly’ and the problem with many scientists in institutional arenas is a tendency toward moral indifference to the uses and abuses of scientific discovery, a Pontius Pilate-like washing of the hands of responsibility for the perverse uses of knowledge made by the technocrat and the politician. There is a subtle self-exclusion by the religionist and an unconscious social amorality by the scientist. Thus, the would-be spiritual seeker who ardently pursues a private ‘glimpse of God’ may become so self-absorbed in his quest for personal salvation that he ignores the needs of suffering humanity while the scientist without the passion of human purpose often becomes a danger to his community by virtue of moral default. The latter disconnects in thought from society-at-large and often, all too willingly, places his or her investigations and discoveries before the behemoth of the state, the altar of capitalism and the fickle goddess of professional fame. The second point that Paine might make would be about the systematic distortion of the intellectual principle in humanity. We have sophisticated, rationalizing theologians at one extreme and materialistic, fact-worshipping scientists at the other extreme. One seeks to fathom the mysteries of God primarily through reasoned faith in collusion with revelation; the other seeks to uncover the mysteries of Nature through analysis and tested sense-experience. Theologians cannot ultimately prove God by reasoned argument nor can science disprove God by empirical methods. All claims about God are based on assumptions that are ultimately not provable or falsifiable. In a similar vein, exaggerated claims by science that it can explain consciousness through the back door of brain research are simply sleight of hand. Consciousness is a non-space-time phenomenon that cannot be empirically reduced to space-time explanation or brain-state studies. Science confuses mind and brain because it can discern empirical correlations between certain brain centers and conscious and unconscious activities. To pinpoint a correlation between certain mind states and certain neurological states does not ipso facto reduce mind to brain. We simply understand that both mind and brain matter mutually influence each other. However, the fledging science of neuroplasticity is rather intriguing since there seems to be some evidence that the minds of trained monks can “will” new neuron pathways and that the mind is not simply an epiphenomenon or creation of brain activity. Alas, poor Man, the thinker, is in the middle between religion and science and is often dwarfed by both. Humanity is either characterized as a sinner by theistic religion or viewed as an evolving, genome-driven intelligence living in a world of “tooth and claw” by latter day Darwinists. Furthermore, free will is either tithed to an unpredictable God or materialized into the ever-determining DNA molecule. More to the point, rationality is distrusted by the religious believer and knowledge confined by the materialistic scientist to the circle of the empirical – together with that highly elusive concept called “experience”. At the common level, emotional intensity becomes the test of religious conviction and unflinching methodological fidelity the hallmark of the scientific elite. However, like Paine, we need to think afresh and at the same time be more self-critical. We should remember that impersonal reason, in its most exalted mood, is really “three dimensional”, “rounded” or “spherical”. Its vertical and horizontal dimensions are usually acknowledged but not its depth. Reason as a “horizontal” activity defines, distinguishes, formulates, compares and contrasts, categorizes and analyzes. Its “verticality” is evident when we use it to integrate, systematize and tier different truths or principles. But beyond these polar activities of rational thought, there is an encircling, illuminated reason that radiates from the center of its perpendicular and horizontal axis. It penetrates into the core of ideas, issues and problems. It is often called intuition, insight and “flashes of genius”. It is a revelatory intelligence that yields new insights and originates new modalities of understanding. Because of its penetrating and laser-like power, it dissolves old thought structures, connects seemingly separate and isolated concepts and gestates new fields of inquiry. This is what Paine is referring to when he talks about those “voluntary visitors” that bolt into the mind unexpectedly and illuminate our understanding. To put this in a different way, we might say that we should not only be open to experimental testing, rational analysis and mathematical calculation but also to analogical reasoning and to those flashes of insight that lead us to new stairways of thought, perception and symbolic meaning. Paine’s admonitions cannot be taken to heart without cultivating a fresh sense of the sacred and a new kind of metaphysical openness. If God is sacred, so is nature and, above all, so is humanity. If metaphysical thought is to be welcomed back into the domain of serious human discussion – if it is to be rejuvenated – it has to lose its element of pretension and become more fluid, imaginative and perhaps adopt the metaphors found in legends, myths and fables to express its insights. If science wishes to become more humane, more socially responsible then it has to deglamorize itself. It has to become morally self-critical as well as to acknowledge its natural intellectual boundaries. What religion and science need to do – the correctives they need to embrace – is actually what we all need to do. We must become as little children again. We must attempt to recapture a new “innocence of the imagination”. What is more, we need to learn as children learn, through love and admiration. Strangely enough, we all too soon forget about the dictates of the “wise heart”. Paine understood this. He was after all a lover of Deity and a lover of humanity. Yet, how easily we overlook the word “love” in the word “Theophilanthropist”. We reduce it to an emotion that gets expressed in a thousand popular songs and a thousand devotional hymns until it has lost its meaning. We subtract it out of the intellect in the hope that we will be more impartial and see truth unadorned, without sentiment, partiality or romantic illusions. Love as a moving, inspiriting force in the pursuit of understanding and insight is ignored. But think about how important love is when it comes to ordinary knowledge or learning. Children love to learn and are never content with settling down and consolidating. Like sunlit trees, they are ever reaching up toward the light of the empyrean. Just as importantly, children have a purity and suppleness of imagination that makes them receptive to different realities. They can live and move in many worlds simultaneously. Furthermore, they resonate to moral ideals and stories of courage and justice. The notion of self-sacrifice thrills rather than frighten them. Furthermore, it is difficult to find smugness or cynicism amongst young children. The creative Eros pervades their feelings, perceptions and their unfolding intellect in myriad ways. We need to recover our felt appreciation of this expansive force that leads to knowledge and its wholesome use in human affairs. We need to reestablish our connection with humanity-at-large and revel in the benign use of knowledge. Clearly, modern man needs to balance reverence, knowledge and meditation. Sadly, institutional religion often denigrates humanity in order to elevate God. In a similar vein, science often reduces humanity in order to objectify it. Why can we not revere the human person as the finest – though imperfect expression – of Deity or a deific principle? Why can we not regard the human body as the finest – though incomplete – expression of Nature? Furthermore, we need to concern ourselves less with knowledge as information and more with knowledge as meaning. We should ask ourselves different kinds of questions about both God and Nature. For example, what do the lives of great spiritual teachers and sages tell us about the possibilities of human growth and high culture, about the scope and depth of moral intelligence? What do all spiritual teachers seem to share in common and how might we actually use their teachings to elevate our societies by returning to moral and cultural fundamentals? Every religious leader should voluntarily engage in a genuine study of the lives of all the great religious founders known to human history. It would be enlightening as well as humbling. Science too, needs to pivot its thinking. In addition to compiling its marvelous encyclopedias on Nature’s laws and processes, it needs to pose human-centered questions to itself and actually discuss them. For example, what do trees teach us about life and human growth? What can we learn from the way a flower unfolds and releases it fragrance? This might sound juvenile or ridiculous but it could actually help us to see that Nature teaches and does not just provide us with information and the keys to new forms of utilitarian satisfactions. Likewise, we might ask, how can contemplation or meditation on universal ideals aid us in our quest to understand the seemingly unknowable in God, Nature and man? Meditation allows us to cleanse the mind periodically of its images of God, Nature and man, to suspend for a moment the assumptions and knowledge we have acquired in order to refresh the mind and rejuvenate the imagination. (Let us note here that contemplation or meditation was the only genuine form of worship that Paine encouraged.) Meditation is best done when we contemplate universal themes: pure space, timelessness, pure matter, pure consciousness, pure goodness, archetypal relationships and the like. This creates “mental spaces” in the mind and heart that allow new conceptions to germinate at an unconscious level until they eventually blossom forth as illuminating ideas or revelatory insights. In a sense, we need to become less identified with specialized roles and more like Emerson’s “man thinking”. We need to be more than scientists. We need to be more than atheists. We need to be more than true believers of a particular religious standpoint. We need to look at each field of thought as a series of questions for individual contemplation and thus be open to seeing life from multiple perspectives. After all, it is perfectly possible to be an atheist and be open to the spiritual, to levels of consciousness, matter and energy that only reveal themselves to the life of inner purity and outer service. By changing our mental focus or our mental lens, we would learn not to get trapped in any particular ideology or system of belief even though we might well be committed to a particular standpoint. Let us conclude our celebration of Paine by returning to the wider sense in which he is generally known. Beyond all his marvelous achievements, there is a deeper truth about Paine. He was not simply a benevolent revolutionary, an incisive political thinker, a gifted pamphleteer, a serious student of science, a committed deist or a brilliant visionary. He was certainly all this. But, more than that, he was a forerunner of the world citizen of the future. He was a paradigm of the ‘person of tomorrow’ because he wove together in his very outlook and actions the golden threads of impersonal spirituality, universal responsibility and intellectual originality. Paine was always more than an American and more than an 18th Century enlightenment figure. He was, like Lincoln, meant “for the Ages”. The resurgent interest in Paine is because the thinking of the world has finally moved in his direction. Modern consciousness is becoming more global and increasingly concerned with the needs and rights of all members of the human family. The ubiquity of human suffering has forced us out of our sectarian and ideological shells and made us appreciate the importance of human interdependence and international cooperation. Perhaps we see less through a ‘glass darkly’ than at any other time in the last two thousand years. We now realize that Civitas Humana or the ‘City of Humanity’ is the true focus of the pioneers of the future. This is precisely why we can turn to Paine for instruction and inspiration. He was always forward looking and able to make eternal principles contemporary. It is no wonder that the most oft-quoted phrase of Paine’s is: “My country is the world and my religion is to do good.” He was a ‘prophet of the future’ as well as a luminous figure of the American and French Revolutions. To honor him is to salute the best in ourselves and in all men and women who dedicate their lives and their fortunes to the civilizations of tomorrow.